March for our Lives protest in Tucson. Gun legislation in Arizona remains a hot-button issue going into election season. Gov. Doug Ducey’s proposed school safety plan, which was unveiled in March, was a contentious bill since Arizona lawmakers can’t agree whether “school safety” and “gun reform” are synonymous. The bill was proposed as a proactive measure towards preventing any more school shootings like the February attack Marjory Stoneman Douglas High School in Parkland, Florida. The bill passed in the Senate with full support from Republicans and none from Democrats. But ultimately, the legislation stalled in the House. Ducey says that passing his school safety bill is one of his highest priorities going into the next legislative session, should he win re-election. But with his plan facing criticism from both Republicans and Democrats, he will have a challenge seeing it become law if he’s reelected. Congressional candidate, Arizona Sen. Steve Smith (R-Maricopa), who sponsored the Safe Arizona Schools Plan, says that while he’s confident that Ducey will be re-elected, the issue is still important enough that it will be addressed—and fast—if he’s not. Smith also thinks gun reform should be addressed at the state level not nationally. The Arizona House of Representatives voted 34-25 in February against a bill to ban bump stocks, House Bill 2023. Ducey’s bill initially had several types of STOP orders—Severe Threat Orders of Protection—that would allow both members of the public and law enforcement to petition Arizona courts to advocate for the removal of firearms from individuals exhibiting severe and imminent signs of threatening behavior. The bill states that after law enforcement presents a judge with evidence that an individual is dangerous, the judge can require that the person in question undergoes a 21-day observation and mental health examination to determine whether or not the person is a risk. The bill saw multiple revisions throughout April and was significantly watered down before it got to the floor for a vote. That final version removed the aspect of the STOP order that allowed concerned citizens to petition for one, allowing only members of law enforcement to do so. Smith says that most people don’t know how to petition a court anyway, so removing that part will allow law enforcement to properly handle concerns. The STOP orders are one of the most contentious parts of the bill, as Democrats argue that they won’t do enough while Republicans argue that they are an overstep by the government. Smith also argues that the addition of armed forces, whether it be through security resource officers or the arming of teachers, is necessary to keep Arizona schools safe. “The majority of the people that talk to me want to see the schools be better protected, and inevitably that means that they want somebody on campus to be able to use force and have force available if needed,” he says. Ducey’s plan would increase the amount of armed security resource officers on school campuses in Arizona. It also would allocate more funds for more trained mental health professionals on school campuses, with $3 million for behavioral and mental health specialists, according to Berry. While Smith, Ducey and Bennett believe that it is necessary to arm more people to combat mass shooters, Democratic gubernatorial candidate David Garcia doesn’t believe placing more armed officers in schools would create the support system that is necessary to prevent school shootings. 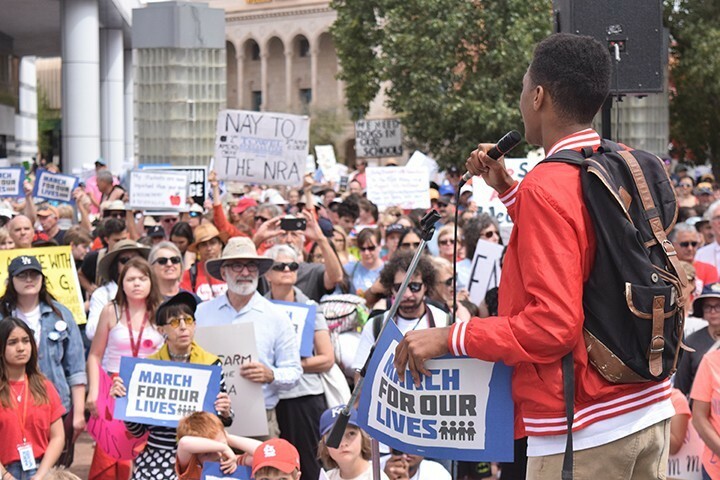 Garcia argues that in order for Democrats and Republicans to mend the division regarding topics of gun control, Arizona needs a governor who doesn’t receive praise from the NRA. The NRA publicly supports Ducey’s school safety plan, which Smith praises. Marissa Ryan is a University of Arizona journalism student and a Tucson Weekly intern.